ADRIANA'S DREAM WAS TO HAVE A DOG THAT WOULD HELP HER "BE NORMAL". AS A HIGH FUNCTIONING CHILD ON THE AUTISM SPECTRUM SHE KNEW THAT "SOMETHING" WAS WRONG. SHE WILL OFTEN SAY THAT HER BRAIN IS "SCRAMBLED". THIS IS HER WAY OF LETTING US KNOW THAT IT IS GOING TO BE A DAY FULL OF CHALLENGES...FOR ALL OF US! ​Our dream was to keep Adriana safe. Adriana has very little sense of danger. She is what they call a runner or eloper-- but not in the traditional escape & hide sense that is typical with Spectrum kids. Adriana had no sense of danger and would run out into the middle of the street or a busy parking lot to save a roly-poly or worm from getting run over by a car. She would wander off through a store because a fly is buzzing her and is going to "GET HER". Our dream continues to be to help her learn how to relate to others and have better relations with her peers. Like Adriana, many children with Autism simply do not have the ability to understand social clues or how to relate with other people. She has no friends. She has never been invited to a birthday party for anyone other than family. Our dream was that of all parents: to help our child succeed. However, as we delved deeper into the world of autism and service dogs, we realized that there was a true need in our community for expanded autism services and service dog training resources. In the Kansas City region there are many service dog trainers and master obedience trainers, but none that focus on autism. There are no facilities available that also incorporate social skills groups with animals. With Terri's background in teaching and Ken's can-do attitude, it was inevitable that something that SHOULD be done COULD be done to solve the problem. Thus, Paws 4 Autism began in July 2010. We have had an autism service dog in our home since November of 2011, and the improvements we have seen are AMAZING!!! She has decreased from 3-4 very violent meltdowns a day to 2-3 minor ones a MONTH. Adriana only had ONE issue at school last year in September with a substitute who didn't know her routine! She knows when she gets anxious or overwhelmed that her service dog Grady is there to help. Grady now recognizes when she is getting overstimulated and he focuses in on her and disrupts the meltdown before it ever really starts. Our family has begun to truly enjoy public outings. Adriana has become a rock star trainer and many times will now talk to people when they ask her about her working dog. As the charity grows, so do our dreams. In 2013, we focused most of our efforts on Community Education and Outreach and our social skills program (CASSIE - Canine Assisted Social Skills In Education). 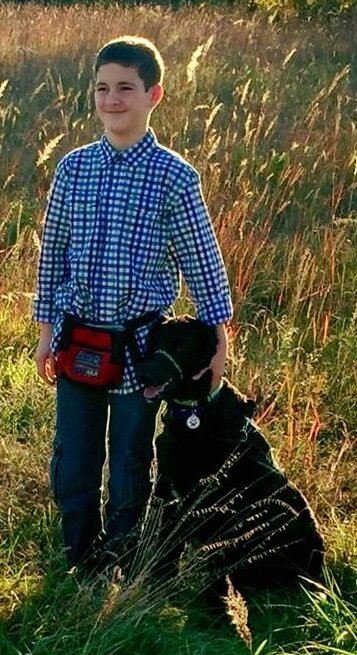 Adi has the first autism service dog we are aware of in the Kansas City region. Most in the area are unaware that service dogs can even help autism until they meet Adi & Grady or even Franklyn! ​In the summer of 2013, two of our families in the CASSIE program decided they wanted an autism service dog for their child.....but they only wanted Terri to train them! Knowing that they would be our first, and that there would be bumps along the way, we began the process of becoming a training agency as well. Terri studied diligently to become a Certified Professional Dog Trainer (CPDT) and is waiting for her exam in the Spring of 2016. PAWS initially partnered with a local shelter for our puppies, however it became evident that too many of our families were also dealing with severe allergy issues. We established partnerships with several nationally and regionally award winning breeders of Standard poodles and completely fell in love with the breed. In October of 2015 we had our first graduate (Jason) and currently have 10 more in various stages of training. Paws has also partnered with the Belton, Missouri School District. Through this partnership we are currently working with three schools. Each school has one of our pups in training there everyday to learn proper school behaviors and how to work with several children challenged by autism. The schools benefit by having a service dog in training available to help their students mitigate their sensory challenges and use the pups to re-focus so that they can get back to learning. In 2016 we expanded our service area beyond the Kansas City Metro to a four hour driving radius of Lees Summit 64082. Our main goal is to establish the EVERYTHING IS PAWSABLE Training and Resource Center so that we can focus on expanding our innovative Train the Trainers program for young adults on the autism spectrum. Through the Train the Trainers Program, teens in transition and young adults that have aged out of most services can apply to become volunteer interns at the Training Center. We teach them how to train, socialize and work all facets of a service dog training program. Once they are ready, they can take the certification exam (CPDT) and be eligible for employment either through PAWS or anywhere in the dog training industry. Those on the spectrum that love animals have a special connection and their training skills fit right in with their own needs (rigid schedule, repetition, sticking to the rules). Once the facility and program are fully established, PAWS will be able to pass along the savings to the families working towards getting an individual service dog for their own child. It's a WIN-WIN-WIN for all! We appreciate your generosity and support as we continue to grow. ​It’s exciting to be a part of an organization that is destined for great things! I really feel that Paws is on the cusp of something very big; we are going to help so many families that are otherwise losing hope. The services we are (and will be) providing will have a far reaching influence on our community. Right now, we are limited to helping only a few of the many who need us, and I’m confident we’ll soon have the financial support and resources needed to expand our services and impact! Paws 4 Autism is 100% volunteer driven. No one will get a paycheck until ALL of our current programs are fully funded! Getting autistic youth involved with service dogs in training is our primary focus. Paws 4 autism is the only known agency to provide social & communication skills classes using autism service dogs in training. Paws 4 Autism has two social skills groups with the OASIS program at Ozanam. We have 6 other facility programs waiting to implement our classes.